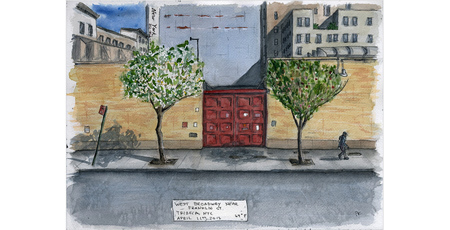 More NYC watercolors posted by artist Peter Koval—above, West Broadway. The 11th year of Open House New York takes place October 12 and 13. Loreley taps the first keg for its 10th annual Oktoberfest season, starting tomorrow. The Last Crop, a film crowdfunding now, focuses on Annie and Jeff Main and their struggle to maintain the family farm, a struggle echoed throughout farms across the country, with enormous consequences for our food system. New York author Matthew Stillman turns Genesis blue in his book Genesis Deflowered. 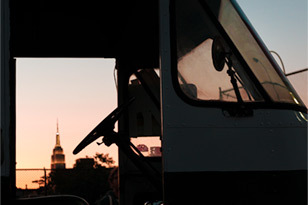 Aldo Sessa photographs at Throckmorton in a show called Reflections of New York City. New EV ice cream shop, Davey's, drawing lines. Next week the original cast album is released for the Keen Company's revival of Marry Me a Little, full of wonderful Sondheim songs. Just out from New York Review Books, No Ordinary Men: Dietrich Bonhoeffer and Hans von Dohnanyi, Resisters Against Hitler in Church and State by Elisabeth Sifton and Fritz Stern. fri 5-10pm: three big soul revival bands, charles bradley + menahan street band, the budos band, and naomi shelton + the gospel queens, play the daptone soul revue at williamsburg park. free. fri-sun: 200+ exhibitors gather at ps1 for printed matter's eighth annual ny art book fair, with artist-led workshops, readings, signings, discussions, screenings, more. free admission. fri-9/29: shipping containers are transformed into temporary exhibition spaces for the photoville art exhibit including lectures, workshops, nighttime projections, a food + beer garden, more. brooklyn bridge park's pier 5. free admission. sat-sun 11am-6pm: the 31st annual queens county fair features a three-acre maize maze, pie-eating + corn husking contests, hayrides, carnival rides, a midway, more. $8 admission, plus $9 to get lost in the maize maze (9/21-10/27). sat-sun: the annual world maker faire takes over the new york hall of science with 600+ makers sharing projects and skills, including 3d printing and steampunk gear-building, plus a life-sized mousetrap, coke and mentos fountains, more. $30 adv/day, $55/weekend. sun 10am-6-pm: 'booklyn' becomes 'book-lyn' during the eighth annual brooklyn book festival, with hundreds of authors participating in panels at nine locations in and around borough hall, plus vendors from local book stores + small publishers. free. sun 10am-7pm: the 27th annual broadway flea market + grand auction raises funds for broadway cares/equity fights aids through the sale of theatre keepsakes (cast recordings, signed posters and playbills, props, costume sketches, etc. ), a celebrity autograph table + photo booth (sutton foster, judith light, bebe neuwirth, bernadette peters, more), more. shubert alley + w. 44th st, free admission.